NASA's MAVEN spacecraft successfully entered orbit around Mars on Sept. 21, 2014. Mars has welcomed a new robotic visitor from Earth. After a 10-month journey through deep space, NASA's MAVEN probe arrived in Mars orbit late Sunday (Sept. 21), on a mission to help scientists figure out why the Red Planet changed from a relatively warm and wet place in the ancient past to the cold, arid world it is today. "Congratulations! MAVEN is now in Mars orbit," MAVEN navigation team member Dave Folta, of NASA's Goddard Space Flight Center in Greenbelt, Maryland, announced to a round of cheers from mission control. 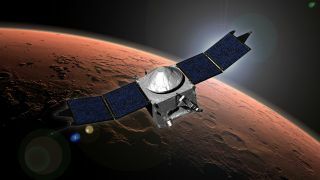 MAVEN joins three other operational probes in Mars orbit — NASA's Mars Odyssey spacecraft and Mars Reconnaissance Orbiter (MRO), and the European Space Agency's Mars Express. NASA also has two rovers actively exploring the planet's surface: the golf-cart-size Opportunity and its younger, bigger cousin, Curiosity. And Mars orbit should get even more crowded just a few days from now. India's first-ever Red Planet effort, the $74 million Mars Orbiter Mission, is due to arrive Tuesday night (Sept. 23). The $671 million MAVEN mission blasted off as planned on Nov. 18, 2013, though not without a bit of prelaunch drama. MAVEN is the first NASA spacecraft dedicated to studying the upper atmosphere of Mars, NASA officials said. The mission will use MAVEN's three suites of scientific instruments to measure and characterize gas escape from the Martian atmosphere, which was once relatively thick but is now just 1 percent as dense as that of Earth at sea level. "What we're going to be doing is studying the top of the atmosphere as a way of understanding the extent to which stripping of gas out of the atmosphere to space may have been the driving mechanism behind climate change," Jakosky said at a news conference Wednesday (Sept. 17). "We should be able to get enough measurements to tell us what happened to the water, what happened to the carbon dioxide." The mission should shed light on the history of Mars' ability to support life, he added. "We're trying to understand the context in which life might have existed," Jakosky said. "Any life on Mars interacts with its planetary environment; we need to know what that environment is, and how it's evolved over time." MAVEN's prime science mission is slated to last one year, but the probe has enough fuel to keep making observations for a while if its mission gets extended, team members said. MAVEN will also serve as a vital communications link between ground controllers and NASA's Mars rovers. In fact, that's the main reason NASA deemed the mission worthy of an emergency exception during the government shutdown. Opportunity and Curiosity are currently supported by Mars Odyssey and MRO, which launched in 2001 and 2005, respectively, and NASA has no Red Planet relay orbiters on the books beyond MAVEN. "MAVEN is critically important for us for many reasons, not the least of which is it will serve as backup communications for the rovers on the surface," NASA Administrator Charles Bolden told Space.com. MAVEN is one of several missions that should help NASA prepare for an eventual manned mission to Mars, which the agency hopes to mount by the mid-2030s, Bolden added. That mission list includes the active rovers and orbiters now studying Mars, MAVEN and the agency's Mars Insight mission, set to launch in 2016, and the Mars Rover 2020 mission. MAVEN's science mission will not start right away. The probe's handlers will spend the next six weeks checking out MAVEN's instruments and maneuvering the probe from its long, looping initial orbit down to a 4.5-hour final orbit, which will bring MAVEN as close as 93 miles (150 kilometers) to Mars and take it as far away as 3,850 miles (6,200 km) from the Red Planet. But MAVEN will make some observations during this checkout period: The probe will look on as Comet Siding Spring buzzes Mars on Oct. 19, coming within just 82,000 miles (132,000 km) of the planet. (For reference, Earth's moon orbits at an average distance of 238,900 miles, or 384,400 km). "I'm told that the odds of having an approach that close to Mars are about one in a million years," Jakosky said. "So it's really luck that we get the opportunity here." MAVEN will study the comet and Mars' upper atmosphere for five days around the flyby, he added. "We should learn a lot about the upper atmosphere from this natural experiment, watching the perturbation from the impact of [cometary] gas and dust," Jakosky said. "And we're hoping to learn about the comet as well." Any material potentially shed by Siding Spring poses minimal risk to MAVEN and other probes circling the Red Planet, NASA officials have said. There are no worries at all for Opportunity and Curiosity, who enjoy the protection of Mars' atmosphere.